What's the Best Way to Find Deals? What’s the Best Way to Find Deals? 5) The risk and hassle involved in a particular property. So let’s say this: I’ll let you in on my favorite ways to find good deals—after I explain why they’re good deals to me. First, let’s talk about exit strategy. If I put a property under contract, one of two things is going to happen to it. If it’s in very poor shape or out of my “farm”, I’ll wholesale it to another investor for a quick cash profit. If this is the case, a “good deal” is a 1-3 unit building that I can get under contract for about 60% of its “as is” value. The other thing I might do is to close it and lease/option it for a year or two. In this case, my “good deal” will be a one family that needs cosmetic work in a decent area that I can buy for 70% or less of the as-is value. In any case, my exit strategy determines what I think is a good deal. If I find a 40-unit apartment building that can be had for pennies on the dollar, I won’t necessarily consider it a good deal, since I have no desire to be a landlord, and know few wholesale buyers who want such things. Ditto a commercial property or a historic rehab. Your financial resources, including the cash and credit you have available to you, also determine what a good deal is to you. Imagine you have no cash and poor credit, but find an owner who will finance with no money down If you pay 100% of the value of the property, but his terms are such that you can still rent it out for a $300/month positive cash flow. Is this a good deal for you, despite the fact that you have no equity? Could be. Is your time well spent looking for these types of deals? Yes, since they are what you can manage. Is mine? Probably not, since I can find lots of deals that cash flow AND have 30% equity the day I buy them. What’s the difference? I know how to offer owners cash. You can’t. Your skills also matter. If you don’t understand repairs, looking for properties that need major mechanical work in order to rehab and resell it isn’t the best use of your time. 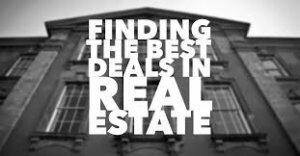 And for heaven’s sake, don’t start looking for “good deals” in large multi-families until you’ve taken at least one landlording seminar! If a deal doesn’t meet your goals, it’s not a good deal no matter how cheap or how good the financing. If your goal is to hold properties long-term for the tax advantages and avoid major rehabs, no junker should ever turn your head. If you flip it, you’ve created a capital gain that you don’t want. If you rehab it, you haven’t met your own goal of avoiding rehabs. Finally, the risk and hassle involved in a deal affects whether the price and terms are “good” or not. I’ve noticed that my wholesale buyers will pay 70% of the after repaired value of a junker property less the cost of repair—as long as the cost of repair doesn’t exceed about $15,000. More than that, and you’re talking really major rehab. Buyers of these types of properties typically want a higher overall profit. Similarly, people who buy rentals in warzones often look for yearly returns approaching 50% of the purchase price. Why? Management hassles, rent collection hassles, hassles with the city…you get the picture. b) My ad in the paper. c) Referrals from other investors and wholesalers.